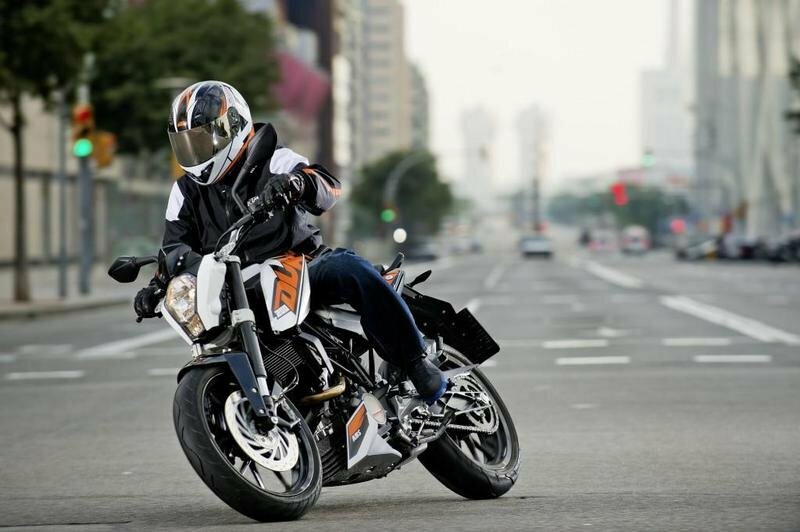 Light, good looking and agile, the KTM 200 Duke is without a doubt one of the most wanted nakeds in its class. 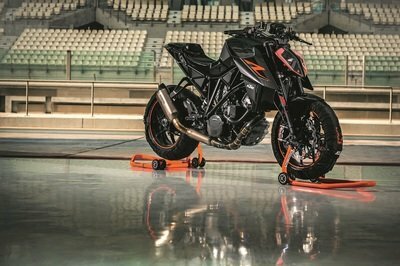 The KTM 200 DUKE‘s backbone is represented by a modern tubular space frame which was especially developed to deliver a perfect balance between lightness and rigidity. 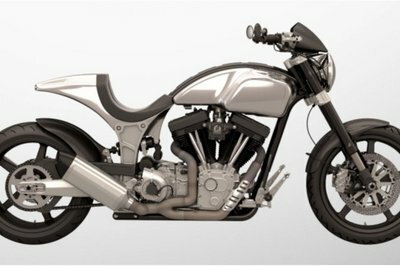 Moreover, the entire motorcycle was carefully designed to keep the center of gravity to as low as possible, thus enhancing high speed maneuverability. At the heart of the KTM 200 DUKE sits a 199.5 cc, single cylinder, 4 stroke, spark-ignition engine, liquid cooled engine which puts out a maximum power of 25 Hp. The engine is mated to a 6-speed, claw shifted transmission and is fueled by a 11 liter fuel tank that offers a riding range of more than 300 km. 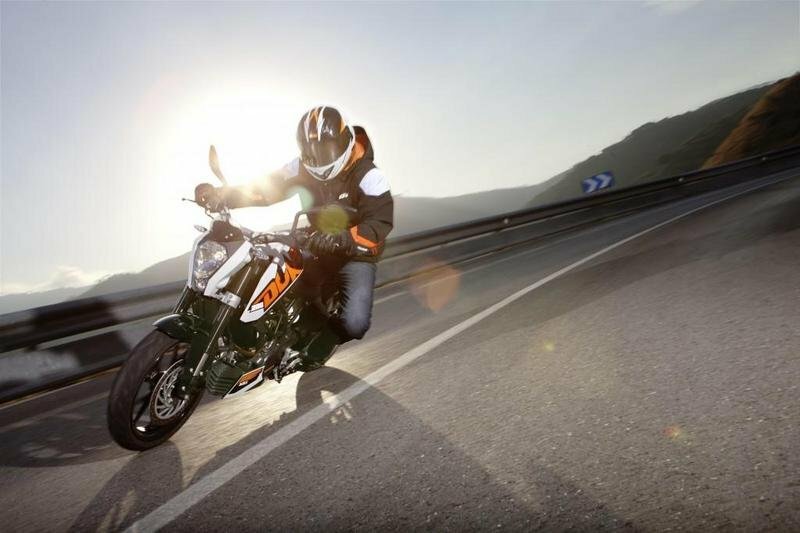 Hit the jump for more information on the KTM 200 Duke. 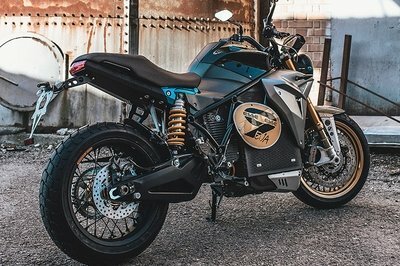 200 Duke: Lightness rediscovered - or the 125 Duke for grown-ups. 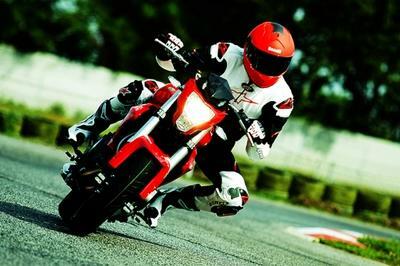 Maximum riding fun, powerful propulsion and optimum user value thanks to thoroughbred motorcycle technology. Featherweight chassis with high-quality components and first-class brakes. 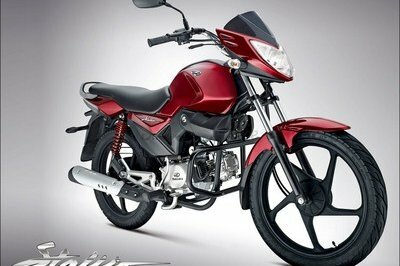 And dynamic cornering fun guaranteed with the surprisingly full-bodied and lively power of the cultivated, new four-stroke single-cylinder with injection, six-speed transmission and low fuel consumption. 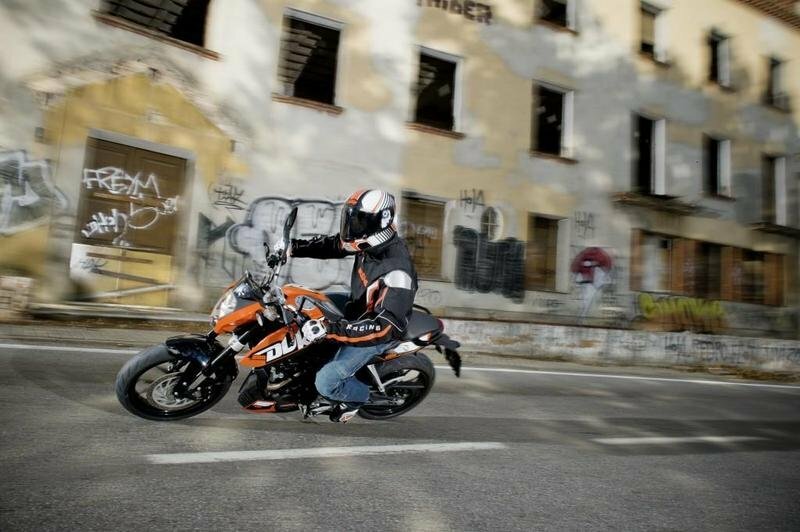 Precisely what you’d expect from a genuine KTM. 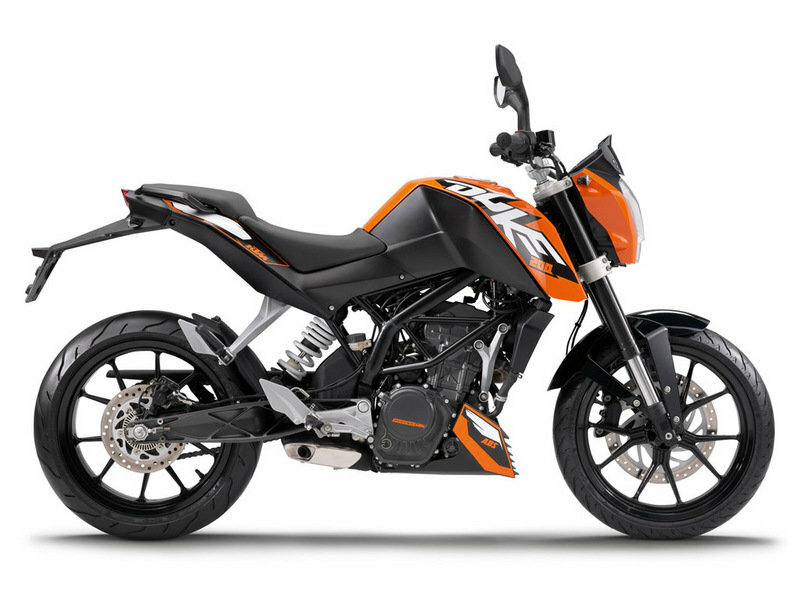 The KTM 200 Duke’s lightweight, high-quality, pin-jointed swingarm is designed and produced according to the same principle as the 690 Duke. The light alloy swingarm with directly linked WP shock absorber excels with extreme torsional stiffness and outstanding tracking stability. 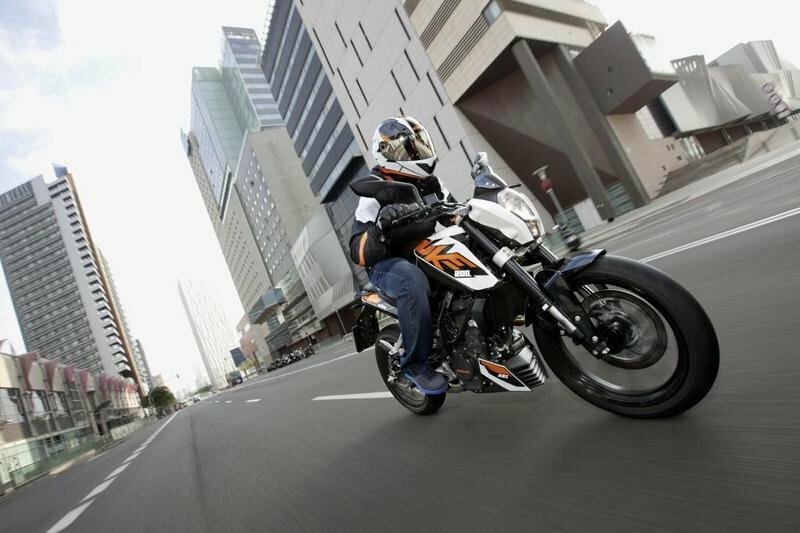 19 kW (25 hp) Power and an unladen weight of only 129.5 kg guarantee tremendous, fleet-footed riding fun with the new 200 Duke 2013. The first-class chassis, with lightweight tubular space frame in the proven KTM design, turns it into a real surfer through the bends. Weight grouped close to the centre of gravity maximise manoeuvrability and precision. The compact, three-chamber silencer is positioned close to the machine’s overall centre of gravity. 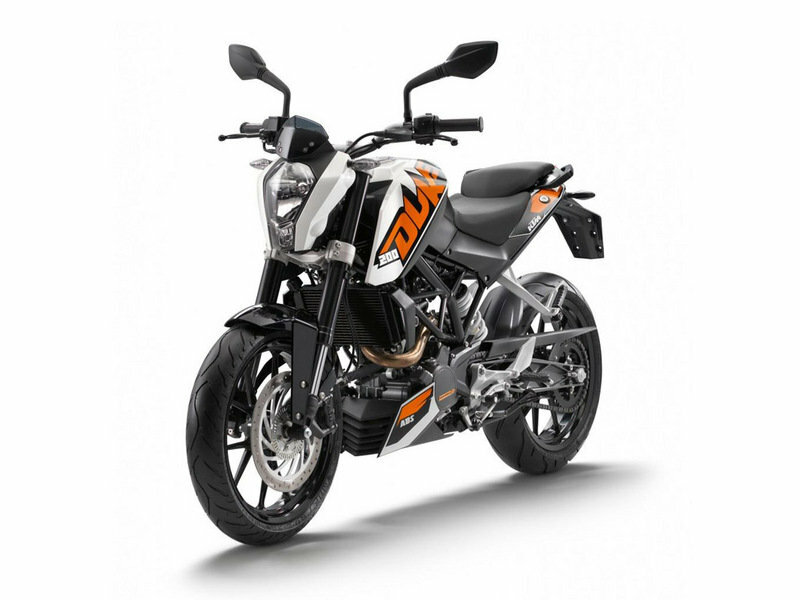 This aids centralisation of masses and improves the easy handling of the KTM 200 Duke. Thanks to a regulated catalytic converter, the emissions are exemplary. No minor development: Based on the state-of-the-art, liquid-cooled, single-cylinder four-stroke engine of the 125 Duke, the 2013 200 Duke’s power unit has been changed substantially to generate 60 % more displacement and correspondingly fully developed power. New camshafts, larger valves, a larger piston with a completely new crank drive, new airbox and new exhaust layout. It all results in 19 kW (25 hp) and incredibly punchy torque, even at lower revs – with irresistible smoothness. The shapely 11 l fuel tank on the 200 Duke not only provides the rider with perfect knee contact, but also with a range of more than 300 kilometres even when ridden on the edge, thanks to the economical engine.